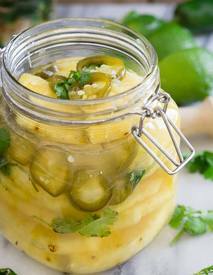 This pickled pineapple has a hint of spice from sliced jalapenos and is the perfect sandwich and salad topper with it’s tangy sweet bite. Pineapple might actually be one of my most favorite pickled ingredients ever. The play between the sweetness of the pineapple and the tart tang of the Nakano citrus seasoned vinegar is just awesome. I chose the citrus seasoned rice vinegar for this pickle because I love how it goes with the spiciness of the jalapeno and the fresh cilantro. It’s the perfect vinegar for the job. Honestly, I could just eat these straight out of the jar as a snack but they also make an incredible addition to any salad or sandwich.